Until the Big Four, portraits of the justices were not a regular tradition with the Michigan Supreme Court. The last of the Big Four to have his portrait dedicated was Justice James V. Campbell on April 24, 1888. Campbell, who died on March 26, 1890, while still in service to the Court, served for 32 years, two months and 25 days, longer than any other person in the history of Michigan. However, his record was very nearly tied by Justice Michael F. Cavanagh. Justice Cavanagh was elected to the Michigan Supreme Court in 1982 and served through 2014. A provision in the Michigan Constitution of 1963 prohibits anyone age 70 or older from being (re)elected or appointed to the bench. Justice Cavanagh was born in 1940 and had turned 70 before the end of his fourth term. On May 18, 2016, the portrait of Justice Cavanagh was presented to the Michigan Supreme Court in a special session. It is the first justice’s portrait to feature the Hall of Justice in the background. 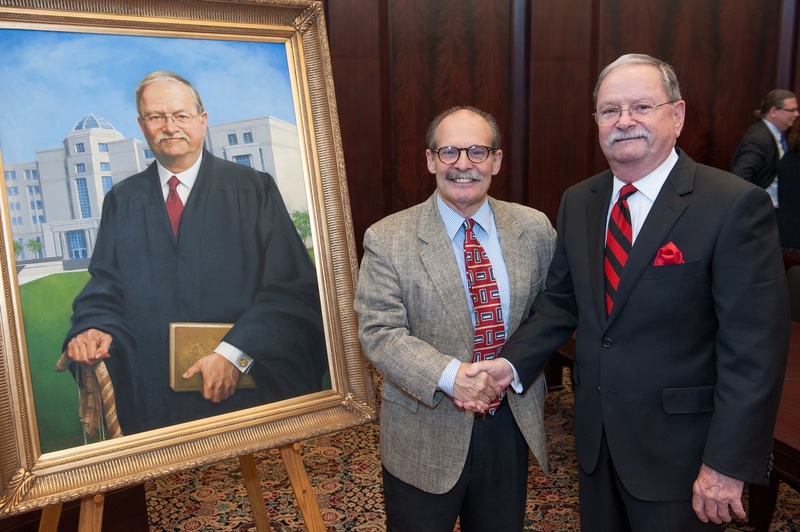 Justice Cavanagh is shown here with his portrait and the artist Michael DelPriore.